Potato salad is one of my perennial summer obsessions. There are enough delicious variations that it’s possible to go a whole summer without having the exact same one twice. 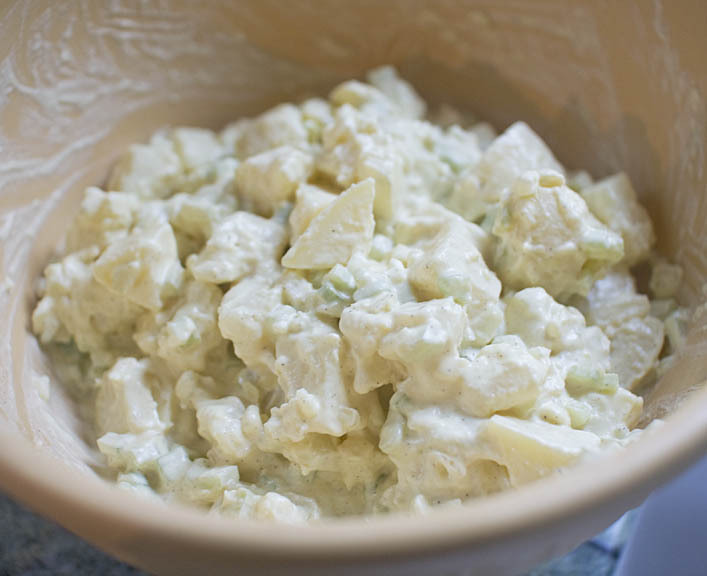 This is a traditional version, and it’s the recipe I go for when I want a basic old fashioned potato salad. It doesn’t have any fancy ingredients, and the generous amount of celery gives it a nice crunch. Peel and cut the potatoes into small chunks. Place them in a large pot and cover with salted water. Bring to a boil and cook 6-8 minutes until they’re firm, yet tender. Drain, and rinse under cold water. Whisk together the remaining ingredients. Stir in the cooled potatoes. Cover and chill, overnight if possible. I always use homemade mayonanaise.